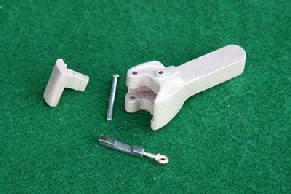 Friends offers old-fashioned "sand cast" couplers for your locomotives and rolling stock. All couplers are from the 1930 to 1950 era, and are by their original designers such as H.J. Coventry, Lester Friend, and Laverne Langworthy. All couplers require machining, assembling, and fitting to your equipment. They make a great "rainy Sunday" workshop project; a blueprint is included with each coupler purchase. Please note, most of these couplers are not suitable for "live" passenger hauling. They are decorative for sure, and are functional when pulling light, no-load trains. For "live" passengers, a drawbar arrangement between cars is suggested. 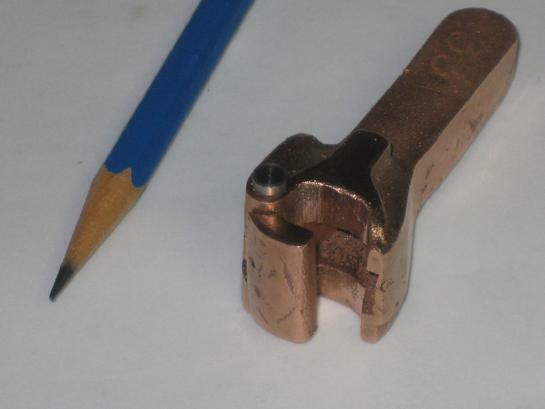 These couplers are produced by the old-fashioned and traditional "green sand casting" method, in order to provide you with not only a coupler, but also a machining experience, that is the same in every respect as the couplers that were available to the hobbyists of prior generations. In 2013, and beyond, you can machine, assemble, install, and use.....the very same couplers that early live steamers used in the 1930s. They are suitable for any of your 3/4" scale steam engines and tenders, as well as any freight cars, cabooses, etc. that you have, or plan to build, in 3/4" scale. Tools & Machinery Required: A layout square for machinists, a scriber, and layout dye; a 3" swing (or larger) lathe; a drill press; files and sandpaper. Suitable for locomotives, tenders, or rolling stock. Used on H.J. Coventry's "P7" and "K4" Pacific-type locomotives, and his "D30" 0-6-0 Switcher. 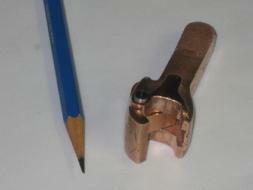 3/4" scale knuckle coupler for 3-1/2" gauge equipment. Designed by H.J. Coventry. Sand cast in bronze. Top and bottom of coupler are sweatted together, then machined. Blueprint included with your purchase. $37.50 per coupler; $75.00 per pair. Shipping $10 to the USA, or $25 shipping to Canada. For other countries, please inquire. To purchase your H.J. 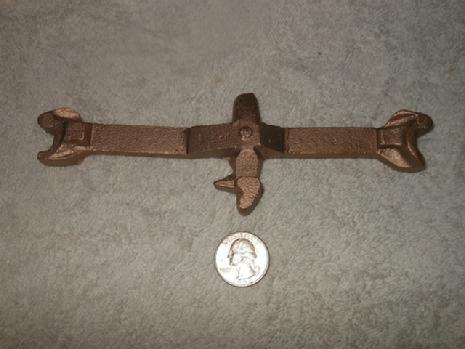 Coventry 3/4" scale bronze coupler(s), please click either of the Paypal buttons at right. The upper Paypal button is for USA shipping ($10), and the lower Paypal button is for Canadian shipping ($25). For other countries, or to pay by a method other than Paypal, please inquire. Used on the tender of the 3/4" scale "Yankee Shop Hudson" by Langworthy. Also suitable for your rolling stock. 3/4" scale knuckle coupler for 3-1/2" gauge equipment. Designed by Laverne Langworthy. Sand cast in bronze. Blueprint included with your purchase. $37.50 per coupler and knuckle; $75.00 per pair. Shipping $10 to the USA, or $25 shipping to Canada. For other countries, please inquire. At right, the "Laverne Langworthy" coupler as it appears after cleanup and fitting of the knuckle. The gating from the foundry has been hacksawed off; the "flash" filed off. The knuckle has been fitted by filing and drilling; and the whole casting was brightened-up with a wire brush. The satisfaction in just getting it to this point is almost indescribable! Another view of the coupler after cleanup and fitting of the knuckle. Working with the "sand casting", and getting the coupler to this point in its construction, provided MUCH workshop enjoyment! Here's a fine example of the "Langworthy" 3/4" scale coupler and knuckle, ready for assembly. Excellent workmanship and photograph by Jack Bodenmann of California, USA. Click the link at left to purchase your Langworthy coupler(s) for shipment to the USA. $37.50 each; $75.00 per pair; $10 shipping. Click the link at right to purchase your pair of couplers for shipment to Canada. $37.50 each; $75.00 per pair; $25 shipping.